The foot pegs on the Ducati 750 Sport were knurled metal cylinders with a slight flare on the outside to keep feet from sliding off. As a consequence there was no top or bottom to the peg. They did fold however, so I had to shim them to get them tight and fold in the right direction – up instead of down. Ducati offered non-folding foot pegs as well. I was sometimes, er, cheap until shown the error of my ways. When I first started racing the Sport I replaced the folding pegs with rigid ones, figuring that when I crashed the peg might keep the bodywork away from the asphalt. Replacing a foot peg would be cheaper than the fiberglass side covers or the steel fuel tank. Also I didn’t need to fuss with shims. Before I raced the Sport I had been running a Ducati single in the 350GP class. 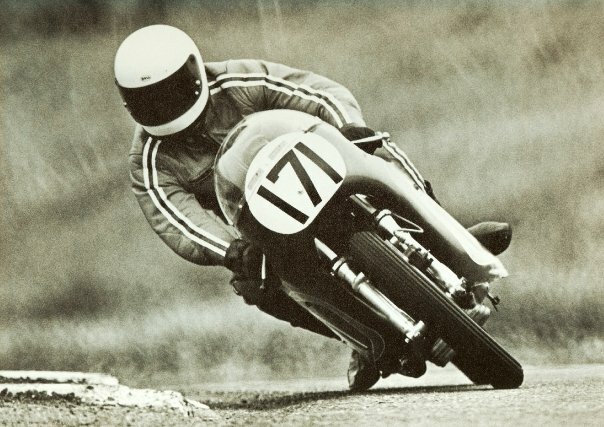 I had adopted a Mike Hailwood racing style, keeping my body in line with the bike instead of hanging off, and using my toes as “feelers” to determine the lean angle. Mush Emmons got a great shot of me using that technique in Sears Point’s turn two, shown here. When I first started racing the Ducati 750 Sport I used the same style. Running at a race early in the year, perhaps only the 3rd or 4th race with the Sport, I was going through turn four at Sears Point, an off-camber right-hander. I must have taken the corner a bit harder than usual as I stubbed my toe on the pavement. Instead of sliding or bouncing back it stuck, and my whole right foot was pulled under the peg, twisting the arch and ankle in a direction it didn’t usually flex. Ow ow ow! It hurt a lot, but I managed to keep upright and actually finished third in class; I even got a small trophy. I was explaining the incident to a racer with much more experience than I, and he suggested putting the balls of my feet, not the instep, on the foot pegs while going around corners. I followed his advice and started putting my toes on the pegs in the corners, giving up the idea of using them as lean gauges. I also put the folding pegs back on the Sport. Dealing with shims hurt less. Monday morning I limped into work and got the “crashed again?” question about a dozen times. “No I finished third, I got a trophy!” I protested. I’m not sure folks believed me. Soon after putting the folding foot pegs back on the Sport I was racing at Ontario Motor Speedway when, early in the race, the right peg loosened and turned enough to start folding down instead of up, which made it hard to shift gears. When I got to the back straight I moved off the racing line and reached down and tightened the foot peg with my throttle hand, then kicked it a couple of times to get it good and tight. I then got back on the throttle and rejoined the race. Several bikes had passed me while I was off throttle. I had re-passed a couple of them before the end of the next lap when the rider immediately in front of me crashed while braking for turn 6. He fell off toward the inside, landing right at the turn’s apex, while his bike slid towards the outside of the turn. I was left with two options – hit the rider or hit his motorcycle. I chose the motorcycle. I hit it hard, thinking as I sailed over my handlebars, this is probably going to hurt. I rolled as I hit the ground so it didn’t hurt as much as I feared, but the front tire was flat and the forks were bent on my Sport. Ow. He was unhurt also, but I couldn’t really be mad at him. If not for the loosened foot peg I would not have been behind him when he crashed, and I was the one who didn’t tighten it properly. After that I not only tightened the foot pegs carefully, I also safety wired them. They never gave me another problem. If this is the stuff that didn’t make it into the book, the book is going to be an incredibly interesting read because I can’t get enough of it. I remember your name from the magazines back then. Reading your stuff is like reliving those years. I’ve never been one to dwell in the past too long, but I’m going back willingly through your words here.